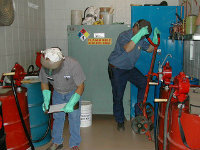 Despite the thousands of health and safety standards or rules OSHA enforces, not every hazard is specifically covered. Hazards do exist where no OSHA rule or standard has been created. OSHA’s General Duty Clause (GDC) makes it clear that employers have an obligation to protect workers from serious and recognized workplace hazards even where there is no standard. The GDC, commonly known as the “catch-all” section, covers many of these gaps, enabling employers to take action to eliminate these hazards. » Employer recognition and knowledge of a hazardous condition. » An awareness of the hazard’s existence within the employer’s industry. » Common sense recognition, where a hazardous condition is so obvious that any reasonable person would have recognized it. » Shall comply with occupational safety and health standards promulgated under this Act. The courts have interpreted OSHA’s general duty clause to mean that an employer has a legal obligation to provide a workplace free of conditions or activities that either the employer or industry recognizes as hazardous and that cause, or are likely to cause, death or serious physical harm to employees when there is a feasible method to abate the hazard. » The hazard was recognized. » The employer failed to keep the workplace free of a hazard to which his or her employees were exposed. » A feasible and useful method was available to correct the hazard. » The hazard was causing or likely to cause death or serious injury. However, no matter what type of business you’re in, OSHA’s rules and regulations affect you, especially the GDC. As an employer you need to understand the general duty clause and general industry standards along with any specific standards that apply to the industry you’re in. It’s also important to understand that the GDC is not an official standard; it exists to fill gaps in OSHA’s regulations for recognized unregulated hazards. GDC violations cannot be issued when a standard exists. The GDC is the core, the foundation of an employer’s safety program.